Australian Naturalist and TV personality Steve Irwin was better known as "The Crocodile Hunter", the blond, khaki-clad, and slightly hyperactive wildlife rehabber whose daring stunts, wide-eyed enthusiasm, and boyish good looks hooked in roughly 200 million viewers in over 30 countries around the world. In 2002, Irwin and his sidekick wife, Terri, took their act to the big screen with the film Crocodile Hunter: Collision Course. In addition to their on-screen activities, the Irwins ran a highly popular wildlife park, Australia Zoo. Irwin was born 22 February 1962 in Essendon, located west of Melbourne, Australia. Although his father Bob was officially a plumber, and his mother Lynn a maternity nurse, the family's consuming passion was rescuing and rehabilitating local wildlife. In 1970 the hobby became a full time operation, as the Irwins opened the Beerwah Reptile Park (later relocated and redubbed the "Australia Zoo"). Even with the advent of a formal facility, the family home was itself a mini-zoo and wildlife hospital, with makeshift marsupial "pouches" slung over the backs of chairs and snakes stashed everywhere. The young Irwin meanwhile came to share his parents' obsession, and he soon displayed an uncanny rapport with wild creatures, able to sense their moods and preferences intuitively. This ability to second-guess animal behavior, coupled with his enthusiastic admiration of Bob Irwin's real life "action hero" escapades with crocs and venomous snakes, led Steve to try his own hand capturing the risky reptiles. Though initially alarmed, his father began tutoring him in crocodile capture. As a young man Steve put these skills to work in the rogue crocodile relocation project run by the Queensland government. Although he eventually claimed the title The Crocodile Hunter, Irwin's methods differed drastically to those of earlier claimants to such titles. That is, rather than ending up as table fare and handbags, the crocs bagged by Irwin were later released, unharmed, in a new home deeper in the wild -- or at the Irwins' reptile park. Able to boast that he and his father had captured or raised every croc in the park, Steve Irwin took over management of the facility in 1991. In that same year he met a lovely American, Terri Raines, on vacation from her own wildlife rehab center in the U.S. Marrying eight months later, the pair opted to go crocodile trapping for their honeymoon. They invited a camera crew along to film the expedition, which later become the first episode of their hit television show The Crocodile Hunter. 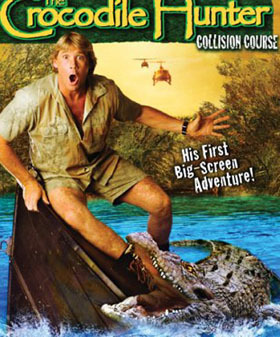 In 2002 Steve and Terri played themselves in Crocodile Hunter: Collision Course, a fictional tale of wildlife conservationists battling crocs and rogue CIA agents to retrieve a fallen satellite. In 1998 the Irwin clan enlarged with the addition of daughter Bindi Sue Irwin (allegedly named after "Bindi", a large female croc at the Irwin's Australia Zoo, and "Sui", the Irwins' beloved dog, now deceased), and again in 2003 with son Bob Irwin. On 2 January 2004, Irwin found himself embroiled in public controversy after he engaged in a crocodile feeding demonstration while holding his infant son, then only two months old, in one arm while feeding a chicken carcass to the close-up croc with the other. In the same incident he was reported setting the infant on the ground beside a pond with a croc in it. The footage appeared on the nightly news, leading locals to call the Queensland Department of Family Services to complain. The Department later reprimanded Irwin, and even acting Premier Terry Mackenroth felt it necessary to express his "concerns with the footage". While members of the press compared the incident to the notorious Michael Jackson baby-dangling incident, the Irwins remained staunchly defensive of the incident, claiming that Steve was in control of the situation the entire time and that the baby was never in any danger. Eventually however, Irwin did concede that, if he had it all to do over again, he might do things differently. Meanwhile, several months later, Steve Irwin again came under criticism for his antics involving antarctic wildlife. While filming a documentary Irwin allegedly broke both international and Australian federal laws by coming too close to a pod of whales and even sliding down snowy slopes with a group of penguins. Again Irwin utterly denied any wrongdoing, and, after a careful review of the documentary, officials dropped the charges. However there remain those who claim the "real" story of what happened on location, and thus any condemning evidence, was simply edited out of the footage. The Irwins eventually released their own version of both these incidents in a special Crocodile Hunter documentary, Crocodiles & Controversy. Despite such controversies, and the embarrassment professed by many of his fellow Australians over his hyperactive high-risk antics and Dundeeish cant, Irwin continued to enjoy tremendous popularity and success, especially in the United States. According to Irwin however, the financial fruits of this success have not gone to fuel a lavish lifestyle, but have been channeled into purchasing tracts of endangered habitat to be set aside for wildlife conservation. While filming underwater at the Great Barrier Reef on 4 September 2006, Irwin was killed when his heart was pierced by a stingray's serrated barb, which the fish wielded in defense as Irwin snorkeled directly above. It was believed to be the first death by stingray ever filmed. While filming an undersea documentary for Animal Planet on the Batt Reef, off North Queensland, Australia, Steve Irwin died in a freak accident when a sting-ray stung him in the chest. Irwin was snorkelling in shallow water above the ray, itself some 8 feet long and a yard across, when the animal unexpectedly reared its spine and struck Irwin near the heart. Purportedly, Irwin had enough time to pull the barb from his chest, but died immediately thereafter. Stings from this animal are rarely fatal unless they puncture the heart or stomach.